The preK-8 LabLearner Program consists of some 60-plus individual science units called Core Experience Learning Labs (CELLs). Each CELL takes approximately four or five weeks for a class to complete, working in teams of four to six students. In grades one through eight, students complete a pretest, taken before the CELL begins and a posttest, taken at the end of the CELL. Pre/post assessments are fixed response evaluations where identical questions presented in an adjusted sequence are asked in both the pre-test and post-test documents. Questions on the pre/post-tests reflect the science concepts taught within the investigations of a CELL. Questions require students to apply their knowledge of a CELL concept to a new situation, interpret experimental results from a table, graph, or mathematical formula, and correlate experimental observations with scientific concepts. In a 2001 study conducted with 1268 public school students from grades one through six, student performance from pre-test to post-test in grades one through six increased by an average of 40%. Comparison of pre- and post-test scores using the Student’s Paired t-test indicated that the improvement in students’ comprehension of science and math concepts taught in the CELLs was statistically significant (p<0.0001) for CELLs in all grade levels. In addition, analysis of the scores (p<0.05) suggested that there was no statistically significant difference on pre/post test performance based on student gender or the teacher facilitating the CELLs. The graphic below, presenting data obtained in 2009, is indicative of similar studies. 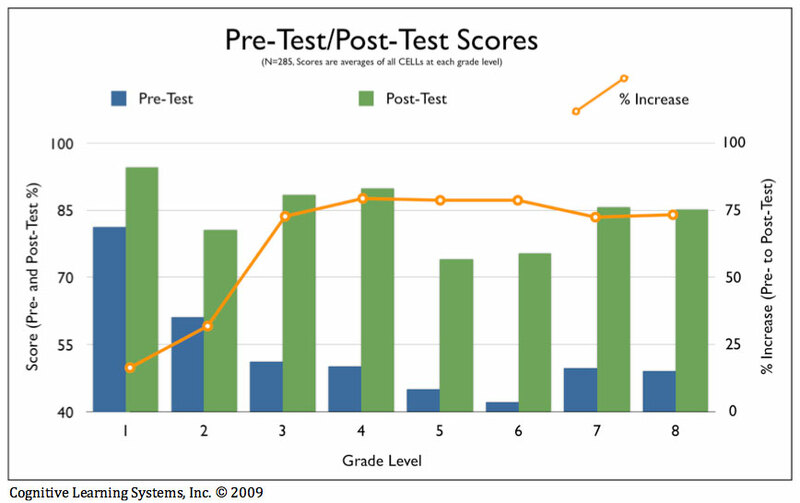 This study, undertaken by 285 students over the course of a year, illustrates the increase in student post-test performance in grades one through eight. In general, differences in student comprehension between pre and post-test tend to increase as students move from primary to intermediate grades. The increase in performance is maintained through the middle school grades, a time in which U.S. schools tend to see a decrease in student science comprehension. These results are typical for LabLearner schools and illustrate the significant impact of the LabLearner program on student comprehension of scientific concepts.